If you time it right the soup will leap directly into the bowl for you. Your once bland lunch will now have a special bubbly zing. You can’t get that from some boring sandwich. Soup Explosion: Fermented, Fomented, FABULOUS. No! Bad soup! Bad! 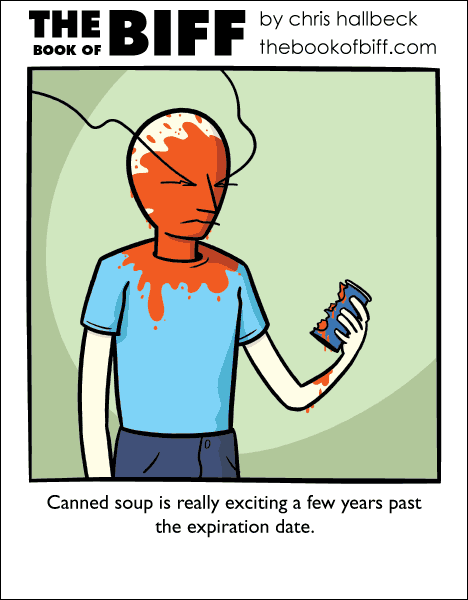 Go back into the soup can and think of what you have done! … OOOW! Don’t bite me! Bad soup! That mouth-numbing tingle? That means it’s working! It’s the stuff in the fridge that fights back that you have to worry about. You obviously haven’t had a “Fresh” sandwich from a vending machine. Wasnt it another Biff comic that told us, Dont go to the deli when the Turkey sandwich is hungrier than you are?